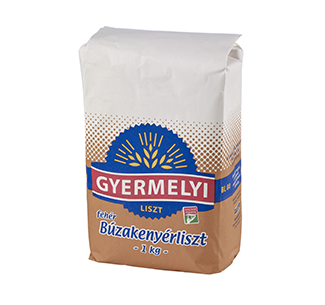 The BL80 code white bread flour is best suited for leavened dough and bread-baking purposes. It has better water retention properties than fine flour and also has a higher mineral content. White bread flour can be used to make soft, yet crusty dough. For the Gyermely mill’s largest clients, superior quality products are of particularly importance. In order to meet this demand, Gyermelyi Holding has established an efficient, self-contained system of wheat production. The quality enhancing, autumn wheat lines are bred by the Centre for Agricultural Research of the Hungarian Academy of Sciences. Seeds are cultivated on our own land, then processed and bonded at our seed factory. Some of the seeds are subsequently planted on our own farms, and the rest in self-contained plots. The wheat intended for consumption brought back from our farms and plots is itemized, graded and stored in silos according to the various categories, ensuring consistent quality and suitable raw materials all year round. Thanks to our self-produced seeds, technology and quality bonuses paid to producers, we have perhaps the best quality wheat in the region.